Permacrete Gisborne has long been a trusted name in concrete products. For over 50 years the legacy of supplying quality product to the East Coast is proof of the Company’s ongoing commitment to the area. Originally set up by Trevor Beattie as Beatties Concrete Products, the company manufactured and supplied concrete tanks and troughs throughout the region. In 1960 Charlie Tohill took over and operated as Permacrete, and what better name to describe this versatile, reliable and permanent material. New ownership in 1995 brought a fresh impetus to the company. Kevin and Helen Smith saw Permacrete as the ideal vehicle to involve their whole family, utilizing the skills of their four sons. Leighton, Ryan, Darren and Weston. And so it is to this day, Permacrete is 100 percent family owned and operated with Leighton as Plant Manager, Ryan as sales Manager and Weston who looks after the marketing and day to day running of the factory. Darren owns Trenchline Contracting Limited, a company previously developed and owned by the family. However he still supports permacrete and vice versa. Kevin, who although officially retired still puts in an appearance every day. It’s this dedication and commitment to the company, and each other that ensures their continued success. The Smiths, through hard work and attention to detail have earned an enviable reputation. It’s well known they provide top rate product with comprehensive service to back it up. Permacrete is all about providing permanent solutions, using renewable resources to help their customers excel. They achieve this through constant research and development, providing a huge variety of top quality products and constantly looking for ways in which to improve… It’s this commitment and investment in the company today that paves the way to a secure future for coming generations. Permacrete continues to make a significant contribution to the success of farms and businesses in the East Coast Region. Water storage will become increasingly important for home owners and farmers alike. It’s vital the quality of water is not compromised through contamination. There are no harmful chemicals used in the manufacture of concrete tanks and materials used are neutral to the environment. In addition the absence of UV light penetration reduces the chance of algae growth thus providing reliable storage of cool clear drinking water, essential for maintaining good health. Concrete water tanks are very robust and have an extremely long life. Permacrete extend a 20 year warranty to their water tanks if they are installed correctly. From tank to tap you can rely on the purity of water from a Permacrete tank. The range of Permacrete product is impressive. There’s a constant stream of farmers, horticulturalists, contractors, builders, plumbers, and home owners through the Makaraka factory gates. Products include water tanks, troughs, septic tanks, dangerous goods stores, cattle stops, drainage products, Permaflow culverts, fertilizer bins, palm kernal bins, silage bins, well liners, traffic barriers, log stops, offal hole covers and of course they offer design and construction of unique, one off specialist jobs. You name it, if its concrete construction they can probably design and build it for you. Plumbing supplies, pvc pipes and fittings, downpipes, epoxies, tools and hardware also form part of the wide range of product available. Advances in technology and ongoing product and market research has seen exciting new and versatile products developed, and the top selling lines fine tuned and improved. Among the most recent introductions to the Permacrete range is the Permaloo. 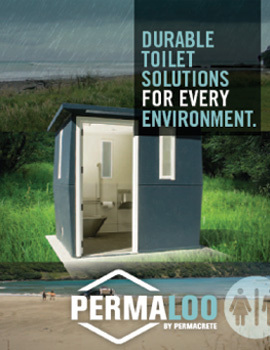 As the name suggests these are robust, durable toilets for harsh environments such as coastal and bush areas. The Permaloo is a simple, yet very effective design, created to satisfy the exacting requirements of councils, the Department of Conservation and other users such as holiday camp owners. Robust, easily maintained and resistant to vandalism they also fit seamlessly into many urban developments. Constructed of natural, permanent, environmentally friendly materials the Permaloo is custom made for each specific environment and has a variety of optional extras such as heavy duty stainless steel fittings, automatic locking doors, easily cleaned, attractive tiled surfaces, automatic lights plus a weather protective front canopy if required. All units are ready to be connected to water/sewage or septic tank in a dry vault situation. Permacrete have an experienced Permaloo installation team. The Permacrete trucks are a familiar sight on the roads delivering product throughout the region and further afield. Their Permaloos are now located as far south as Christchurch, and Kerikeri in the North.